Formed in 1942 at RAF Digby in England 441 Squadron served in England, France and Belgium during world war II flying the Supermarine Spitfire and the North American P-51 Mustang. After the war the unit was disbanded in England only to be reformed a RCAF St. Hubert in 1951 as a part of 1 wing. They arrived at their intended location at Marville France which was home to the unit untill 1967 at which point they moved to Lahr in Germany. 1971 saw the unit move the CFB Baden-Soellingen where it would continue to fly operationally untill it was withdrawn from Europe in 1986. 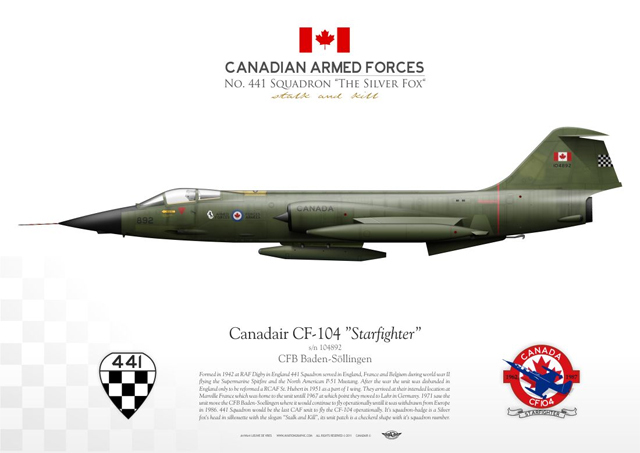 441 Squadron would be the last CAF unit to fly the CF-104 operationally. It’s squadron-badge is a Silver fox’s head in silhouette with the slogan “ Stalk and Kill”, its unit patch is a checkerd shape with it’s squadron number.